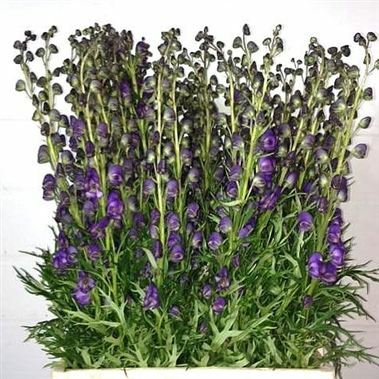 Aconitum Napellus 70cm is a beautiful deep purple cut flower - wholesaled in 10 stem wraps. (Aconitum is also commonly known as Monkshood). Aconitum, (also known as aconite, wolfsbane, monkshood, leopards bane, womens bane, devils helmut and blue rocket), is a genus of the buttercup family. Aconitum is a beautiful tall spike flower, similar looking to delphinium, with large hood shaped flowers. Because of the shape of the flowers, the English named it 'monkshood'.